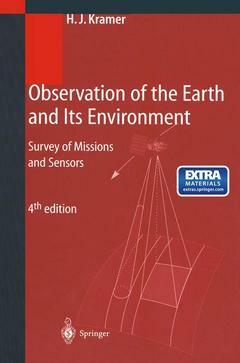 Observation of the earth and its enviroment, survey of missions and sensors (with CD ROM, Windows/Macintosh version) Kramer Herbert J. Add to cart the livre + cd of Kramer Herbert J. Add to cart the livre of Kramer Herbert J. This book is about spaceborne missions and instruments. In addition, surveys of airborne missions and of campaigns can be found on the accompanying CD-ROM in pdf-format. Compared with the 3rd edition the spaceborne part grew from about 300 to 1000 pages. The complete text, including the electronic-only chapters, contains more than 1900 pages. New chapters treat the history of Earth observation and university missions. A chapter contains reference data and definitions. Extensive appendices provide a comprehensive glossary, acronyms and abbreviations and an index of sensors. An effort has been made to present the information in context, to point out relationships and interconnections. The book may serve as a reference and guide to all involved in the various national and international space programs : researchers and managers, service providers and data users, teachers and students. Print and Electronic:Earth Observation Short-History.- Atmosphere/Radiation/Aeronomy Missions.- Commercial Imaging Satellites.- Data Collection Systems.- Earth Observation/Monitoring Missions.- Geodynamic/Earth-System Missions.- Meteorology/GEO Missions.- Meteorology/LEO Missions.- Satellite Radionavigation Systems.- Satellite Emergency Services and Environmental Monitoring.- Shuttle/Selected Missions and Payloads.- Space Science/Solar-Terrestrial Missions.- Space Stations.- Technology Missions.- University/Student-Developed Satellites and Payloads.- Reference Data and Definitions.- Appendices: Glossary/Acronyms and Abbreviations/Index of Sensors.Electronic Only:Survey of Airborne Sensors.- Survey of Campaigns.